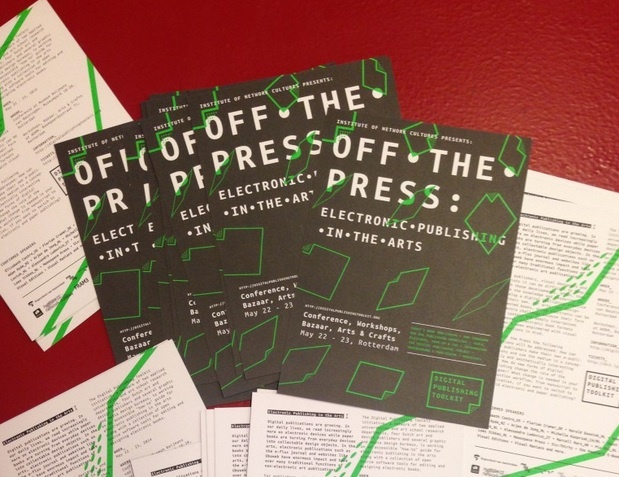 I’m delighted to announce my participation (on behalf of the Greyscale Press publishing project) in the Off The Press conference, May 22-23 2014, organized by the Institute of Network Cultures, Rotterdam. Other speakers include Alessandro Ludovico, Florian Cramer, Traumawien, Sebastian Luetgert, Marcell Mars, Dusan Barok… how exciting to be in such good company! This talk will review the latest productions of Greyscale Press, and expose the promiscuous workflows and methodologies we put in place to fit our needs, urges and dreams. The electronic publishing disruption has induced a range of uncanny side-effects: print-on-demand spam is lurking on library bookshelves, publishers-entrepreneurs are buying into the infinite monkey theorem, while a whole generation of writers is turning SEO-aware. The Gutenberg Galaxy is full of black holes. Embracing those phenomena, Greyscale Press deliberately runs against the tide of analog-to-digital conversion, turning born-digital materials into physical forkbombs.